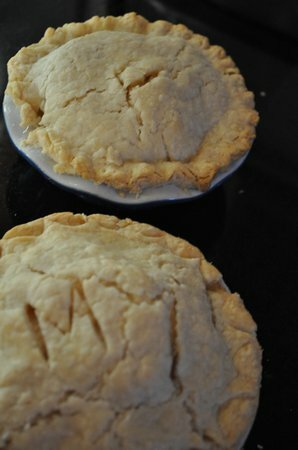 I love to cook and bake, but I’m not a pie maker, at least I haven’t been. 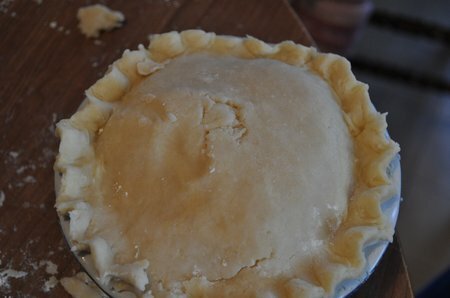 My mom’s been making pie since she was 12 years old, and never used a frozen crust in her life! 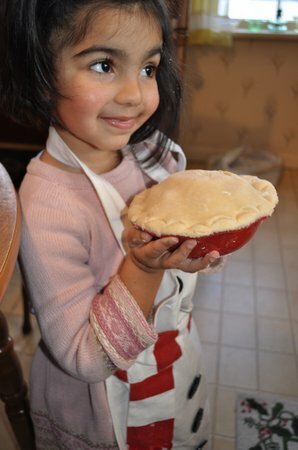 When my daughter Paige recently asked if I could teach her how to make apple pie, I directed her to Nanny. 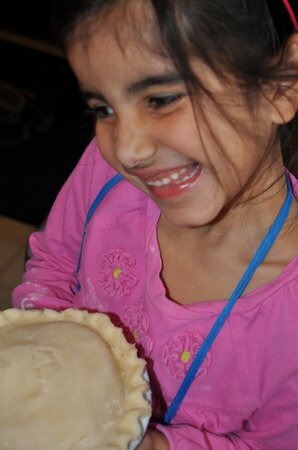 Perhaps the flaky crust gene skips a generation. 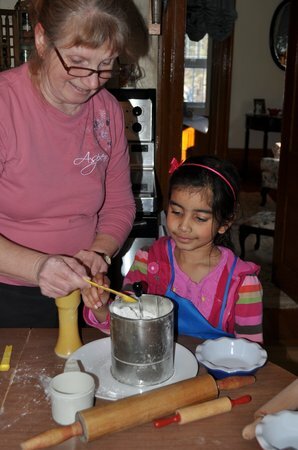 Nanny rose to the occasion, getting the girls the sweetest little pie plates, and rolling pins,and directing them to come to her house with their aprons. 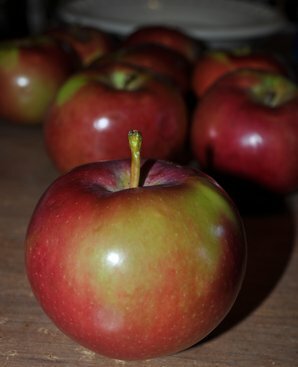 They’ve been counting down the days, and today it was finally apple pie making day! They started with the crust. Nanny swears by the Crisco recipe that comes on the box. She does it old school. She owns an old fashion sifter. My girls didn’t even know what it was. 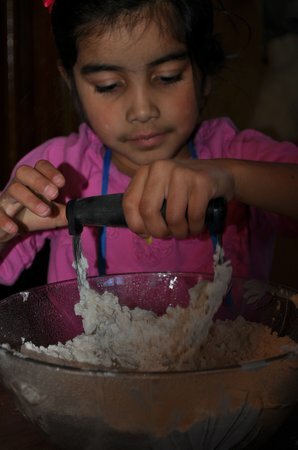 Cut room temperature CRISCO Shortening into flour with pastry blender or 2 knives until mixture resembles coarse crumbs. 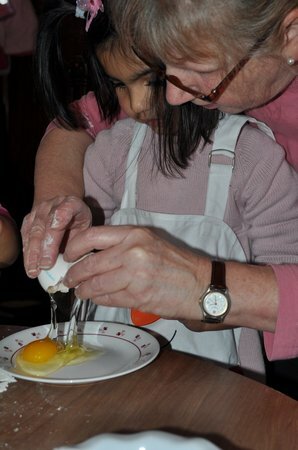 Beat egg, water and vinegar together to blend. Pour all the liquid over flour mixture. 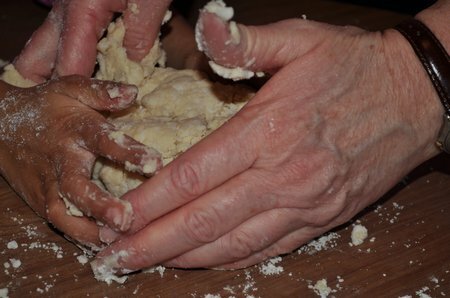 Stir with fork until mixture is moistened use your hands, the way your Grandmother did. 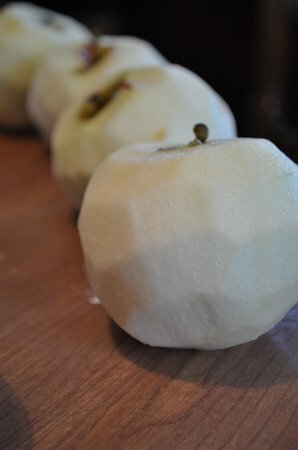 Divide dough in half and shape into a ball. Flatten each into a circle about 4″ (10 cm). Wrap and chill dough 15 minutes for easier rolling. 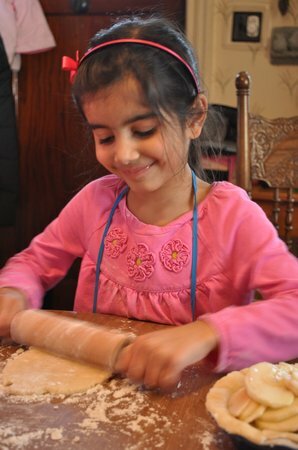 Roll each portion of dough separately. 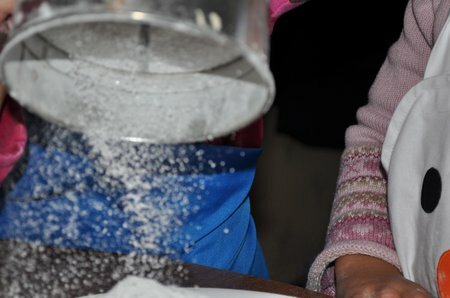 Dust rolling pin and work surface lightly with flour. 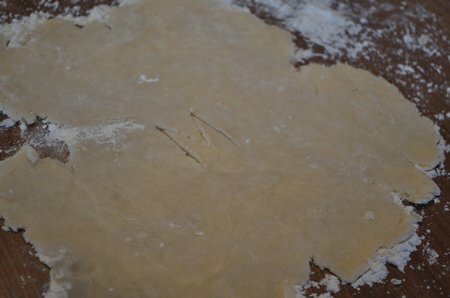 Roll dough to a uniform thickness in spoke fashion from centre to edge with light even strokes. 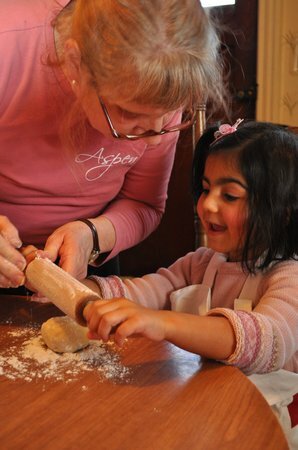 If dough sticks, dust lightly with flour. 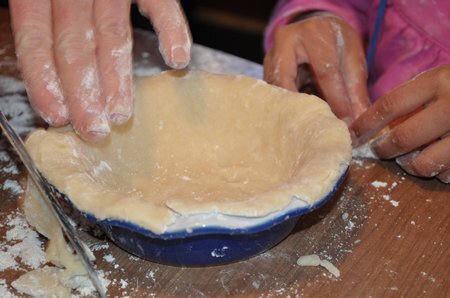 Roll to a circle about 1″ (2.5 cm) larger than upside down pie plate. 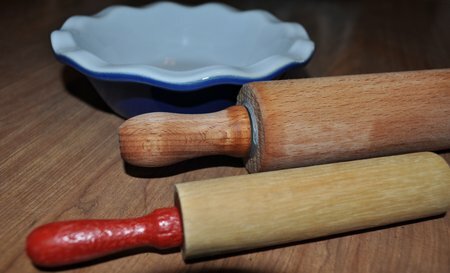 For easy transfer to a pie plate, slide spatula under dough to loosen it, then lift one edge of pastry onto rolling pin and loosely wrap it around the rolling pin. Unwrap pastry into pie plate. 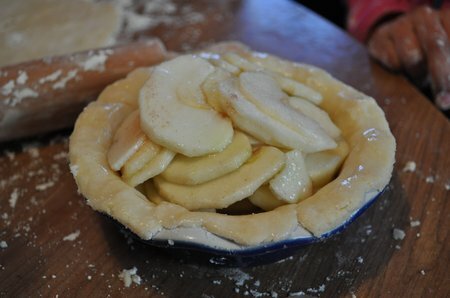 Ease into pie plate without stretching. 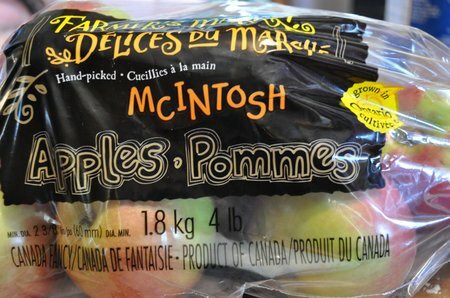 My mom likes to use McIntosh apples for pies. 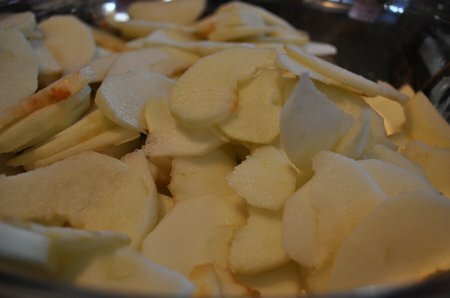 Then, cut them into slices. Add some flour to thicken the juices, and some sugar, and cinnamon for sweetness and spice. Mix well. 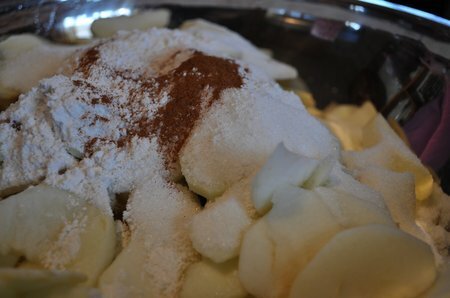 Use this mixture to fill your pie shell. Repeat rolling with remaining pastry for top. and bake according to your filling recipe. 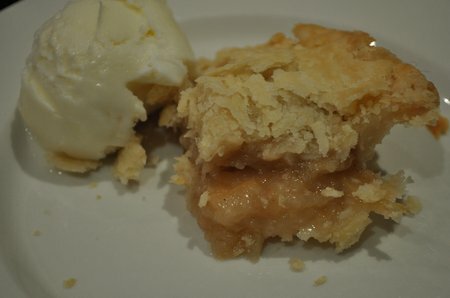 The pie was delicious, with a tender, flaky crust, and sweet apple filling! 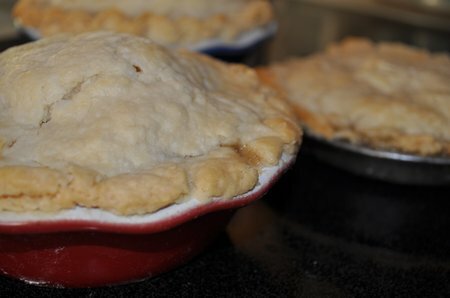 It took me back to my years as a little girl when homemade apple pie was a pretty everyday occurrence. Now, perhaps my kids can make me some on a regular basis again! 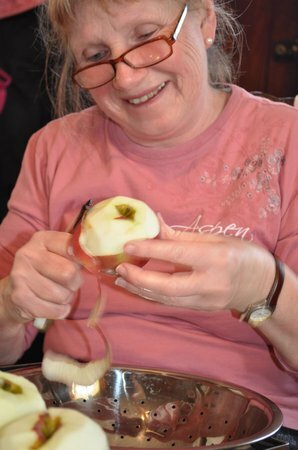 May some of your parties include apple pie this week too! This post is linked up at Tatertots and Jello, Under the Table and Dreaming, Be Different Act Normal, A Little Lovely, and TidyMom. Hey – love this idea – but where did she get the pie plates? so glad you posted this..
Doesn’t it remind you of Grandma? And it tasted like hers too, so maybe you should give it a try. Thanks for your always so encourageing coments.